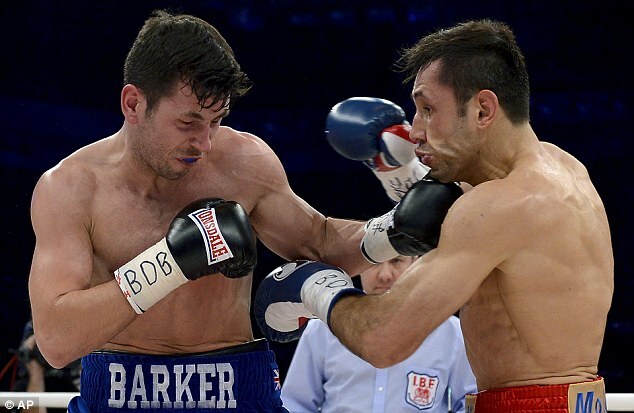 Darren Barker waited a fighting lifetime to win the world title of which he had always dreamed but after holding it for only a brief four months he lost that IBF middleweight belt inside two devastating rounds. The thousand Londoners who had journeyed from Stuttgart fell into shocked silence at the sight of their man screaming in agony as Germany’s Felix Sturm battered him to the canvas twice and then to crushing defeat. Barker was clearly in pain as he clambered to his feet for the second time and limping so heavily that it was no surprise to hear that one of his two hip replacements, the right, had dislocated in the first round. Sturm, the renaissance man, hungrily grasped the chance to become Germany’s first four-time world champion. Graciously, he immediately offered to travel to London for a re-match but retirement may be beckoning Barker now. His trainer Tony Sims admitted as much when he said: 'It's a disaster really. I don't really think you'll see him in a ring again now. He's had all these problems with his hips before, he's had them operated on and they're just not right. 'He's completely gone. They're going to take him to the hospital to do an X-ray on that and we'll see what's happening from there. 'It's really disappointing. We had a game plan and he'd done loads of sparring. You don't imagine this is going to happen in a fight, especially in the first round. 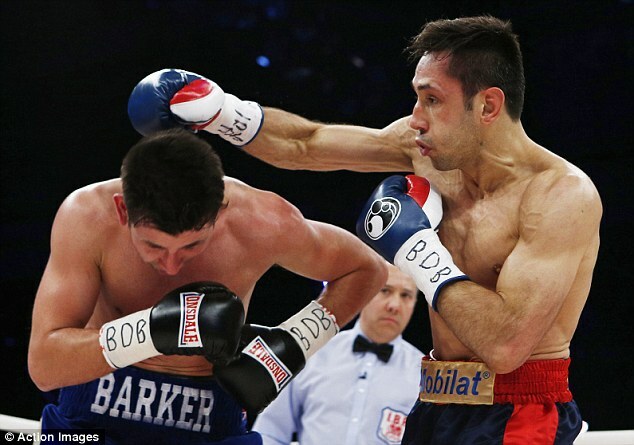 Certainly, Barker was in no condition to carry on when his corner and the referee intervened two minutes and nine seconds into round two. After taking a rousing first round by virtue of his left-right combinations, Sturm weathered what can now be seen as a desperate last charge from Barker to drop with two wicked rights. Barker – who had climbed from the canvas to win this IBF belt from Aussie Daniel Geale in America in August – again made it to his feet. But the end was nigh. When Sturm landed another combination Barker’s physical collapse made it impossible for him to retain his balance and he pitched headlong again. When he staggered to his feet this time his face was contorted in pain. Sturm closed in for the finish and Sims threw in the towel and American referee Mark Nelson hurried to rescue Barker from worsening punishment. 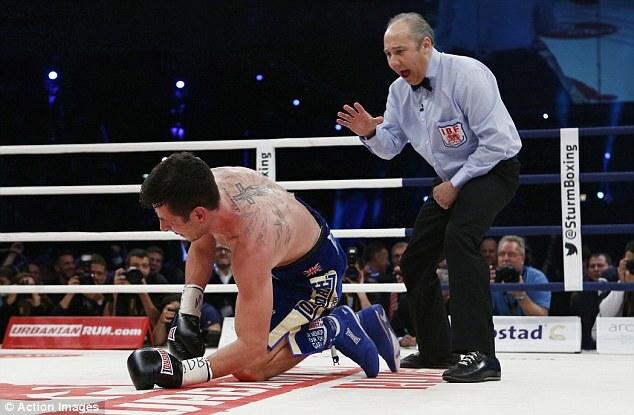 In previous title battles in Germany it has seemed that Sturm has been the beneficiary of some hone-town decisions but there was no need to call on the judges this time. He had promised we would see a more aggressive Sturm than the one to whom we had become accustomed boxing his gloves up at the sides of his had to block shots and relying on counter punches to steal the rounds. Good as his word, he opened up with a salvo from the first bell and then exchanged with Barker, winning the opener by virtue of his crisper left-right combinations. Once had seen off Barker’s early second round flurry the German took total charge. The wounded Barker was the bull to Sturm’s matador but with his fans baying for a quick kill he was in no mood to toy with his opponent. The intervention was merciful; the outcome beyond any dispute. Sadly for a nice guy and a stylish boxer, the future for Barker does not appear healthy. The consolation for Barker is that by agreeing to defend his title in Germany he secured the biggest purse of his career, reportedly €1million. Sturm, his own promoter, had considered it worth making that investment to regain a world title against a man he believed he could defeat.